Searching for a thoughtful gift for the Supernaturally obsessed? How about something that not only gives joy to your bestie, but also provides for those in need? That seems pretty darn thoughtful. 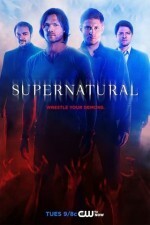 Creation Entertainment, sponsor of Supernatural conventions throughout North America, created an online shop in which a portion of all items sold go to support the actors’ designated charities. A variety of Supernatural actors participate, including Jared Padalecki, Jensen Ackles, Misha Collins, Richard Speight, Ruth Connell, Mark Sheppard, Kim Rhodes, Briana Buckmaster, Rob Benedict, and Alaina Huffman. One of our favorites is the Supernatural Shadows T-shirt. Wearing silhouettes of three tall men is certainly a flattering look. Looking for a gift that will represent the fandom every day? By giving Dean’s Amulet Necklace, aka the Samulet, you can protect your pal with this Supernatural charm. Just as Sam gave Dean this brotherly gift in “A Very Supernatural Christmas,” you can share a special moment that will bond you for life. If the amulet burns hot, keep an eye out for the divine. Supernatural is about family, but let’s not forget—it’s about hunting monsters too. For those who love the Monster of the Week aspect of Supernatural, check out The “Supernatural” Book of Monsters, Spirits, Demons, and Ghouls by Alex Irvine. It tells the Supernatural fan all there is to know about supernatural creatures such as the Woman in White, Jinn, Wendigo, Pishtaco, Baba Yaga, Banshee, Vodyanoi, Hellhound, and other monsters from the perspective of the Winchester brothers. For those who loved the Supernatural episode “Ask Jeeves,” the Supernatural Collector’s Edition Clue Board Game makes a fantastic present. After the family watches Supernatural, take the Winchesters with you into the weekend through a fun game of Clue. If you’re looking for some spooky and supernatural gifts, don’t forget to check out our Monster Packs. For those interested in talking to the dead, the Hydesville Ghost Pack makes the perfect gift. The Salem Witch Pack looks at a dark period in American history, encapsulated within a fun pack of cool goodies. For that person in your life who can’t get enough of the undead, the Geneva Vampire Pack is the ultimate offering. Have you ever gotten a cool Supernatural gift? Tell us about it in the comments. ← Supernatural S11E09 Recap: O Brother Where Art Thou?